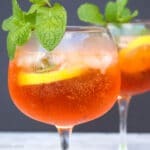 The Aperol Spritz is a very popular cocktail in Italy and other places in Europe. A combination of Aperol Liquor, Prosecco, lemon or orange, and soda water. Fill an 8-ounce glass 1/2 way with crushed ice. Add a slice of lemon to the side of the glass. Add Aperol, lemon juice, and simple syrup. Fill the glass almost full with Prosecco. Top off with a little bit of soda water. Garnish with a big handful of fresh mint.